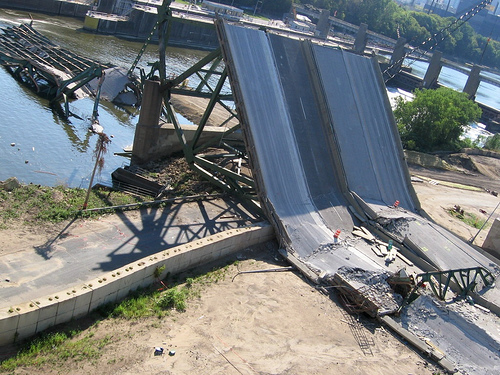 On that tragic Summer afternoon of August 2nd, the commuters on the I35 Bridge in Minneapolis, returning from the grocery store, daycare, or work, could not have imagined that the roadway would collapse beneath their tires. A bus full of school children was spared but a pregnant mother and her two-year-old daughter among others were not so lucky. In the face of such catastrophes, it is natural for believers to question the nature of their god. Reflecting on this tragedy I am reminded of The Bridge of San Luis Rey the 1928 Pulitzer Prize winner by Thornton Wilder. The story tells of an old Inca rope bridge spanning a deep chasm in the Peruvian Andes that snaps, sending five people to their deaths. The event is witnessed by a friar who is compelled to discover why these seemingly innocent people had been chosen by God, or fate to be on the bridge at the moment it failed. His labors reveal much about the lives of those who perished on the bridge but fails to deliver on his search for an unanswerable truth. In a final twist of irony, the friar’s work is condemned by the Catholic Church and he is burned at the stake for heresy. On the Sunday following the bridge collapse, hundreds of Minnesotans from diverse creeds gathered in an Episcopal cathedral to memorialize the dead, seeking for some kind of meaning in the tragedy. Maybe some found it. Others, their faith shaken might choose to leave it…collapsed.